With Red Line dead, what is Hogan’s ‘best way’ for Baltimore? Key moments in Gov. 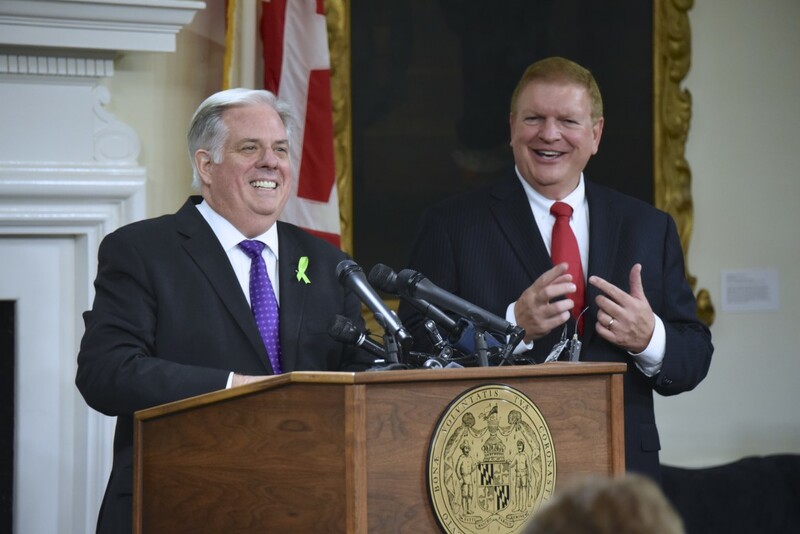 Larry Hogan’s first term took place last week, but it is unclear how his cancer and much anticipated decisions on transit projects will define his term as governor. His red light for the Red Line light-rail project in Baltimore and a cautious go ahead for the Purple Line in the D.C. burbs would have been enough to chew on politically for weeks. But they came in context of the more shocking revelation of his cancer diagnosis that will certainly be a setback for any great plans in the coming months. There’s a lot of positive talk and prayer for the 59-year-old governor as he begins intensive treatment of the non-Hodgkins lymphoma that has invaded much of his body. Whatever the prognosis, there is little doubt that the chemotherapy will lay him low for weeks at a time even if successful. And however he may feel, he will look like hell. The happy warrior and energetic campaigner will not look very happy or energetic. His decisions on the two big transit projects left more questions unanswered last week. The yellow light on the Purple Line from Bethesda to New Carrollton was greeted warmly by some supporters. But other supporters, like House Speaker Michael Busch, wondered if the yes, accompanied by many changes in financing, was really a way to say no. U.S. Rep. John Delaney, a former financial services CEO, was more explicit about his doubts. “What I fear is that the Governor has implemented a process to derail the project, and derailed the billions in new investment in economic development and thousands of jobs it could create,” Delaney said in a statement. “I’m uncertain as to how it can be successfully reformulated with materially less state funds and worry that such an effort may effectively terminate the project. Hogan and his transportation secretary offered none of that last week. All the Democrats in the Baltimore-heavy congressional delegation were upset at Hogan’s killing the Red Line. But while the business and political establishment were solidly behind the Red Line, there were more significant doubts raised in the community at large, as Mark Reutter spells out in Baltimore Brew. The Purple Line has significantly more riders, a lower cost per mile, and connects with four metro stops and other transit hubs. The Red Line, with its expensive tunnel, connected to very little but the underused light rail line. There is no question that Baltimore needs more mass transit, and is poorly served by the routinely late bus lines of the state-run Mass Transit Administration. In the aftermath of the Freddie Gray looting and demonstrations, Hogan pledged help for the city. “There’s no place in the state where we invest more money than Baltimore City,” Hogan said last week. That money may or may not be well spent, but it certainly has not achieved its goals. “I’m committed to promoting economic development to Baltimore, but the Red Line as currently proposed is not the best way to bring jobs and opportunity to the city,” said Hogan. His commitment seemed sincere in the week he spent walking the streets of Baltimore after the Freddie Gray disturbance, but left unanswered is what that “best way” from the state might look like. Whatever energy Hogan might have put into that effort must now be redirected to fighting his personal battle with cancer.